LeBron James had an anti-inflammatory injection in his back last week. 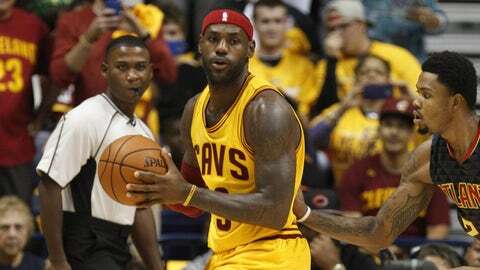 CLEVELAND — LeBron James sat out Cleveland’s final preseason game against Dallas on Monday night, but Cavaliers coach David Blatt said the four-time MVP will be ready when the regular season opens next week. James, who had an anti-inflammatory injection in his back last week, hasn’t played since Oct. 12. Asked before the game against the Mavericks if there was any chance James wouldn’t be ready when the Cavaliers visit Chicago on Oct. 27, Blatt said, "he will absolutely be ready for the season opener." James missed a career-high 13 games last season with back and knee issues. The injuries forced him to miss two weeks, reviving him for the second half of the season. James led Cleveland to the NBA Finals for just the second time. "I think he’s been a pretty good player for a long time in our league doing things a certain way and his game is always evolving as do most experienced players and veteran players," Blatt said. "Do I specifically want to keep him out of certain areas of the game to rest him? No. I think the better thing would be to, as we did last year, keep his minutes at a reasonable number until we get close to playoff time and have him fresh that time of the year." James, 30, is entering his 13th season. His teams have been to five straight Finals. 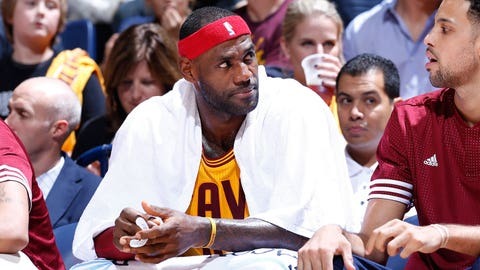 "I would hesitate to put `Bron in the category of an advanced age player," Blatt said. "He’s not. He is in terms of the number of games he’s played or given the fact he’s constantly deep into the playoffs and his greatness helps his team achieve those levels. We will, of course, constantly consider what his physical state is. But I don’t think we have to go overboard. The guy is a great, great basketball player and he’s also proven to be durable and ready to play. " Cleveland has gone 0-6 during the preseason while dealing with several injuries. Kyrie Irving fractured his left kneecap in Game 1 of last season’s NBA Finals and it’s uncertain when he’ll return. Kevin Love played for the first time Sunday after dislocating his left shoulder in the opening round of the playoffs. Love was also in the lineup against the Mavericks.